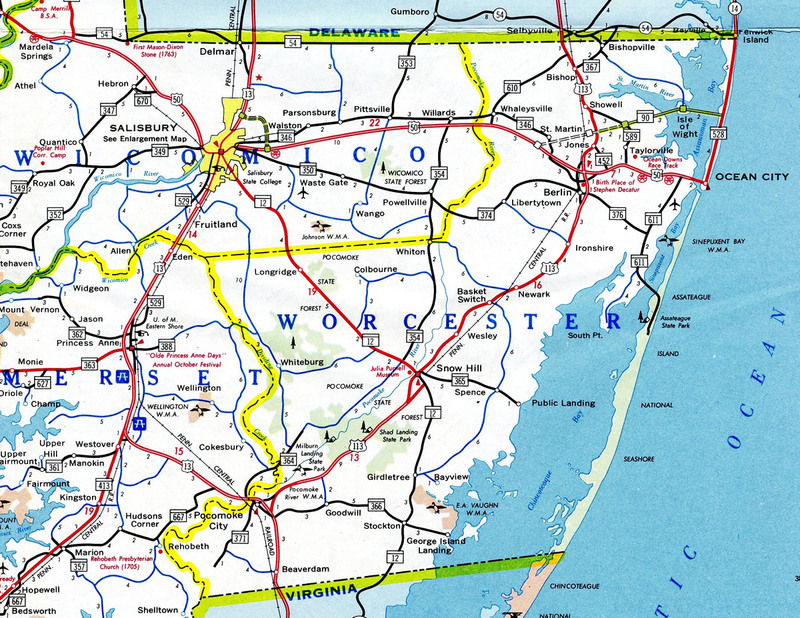 U.S. 113 runs nearly the height of Worcester County, from U.S. 13 at Pocomoke City north 37.49 miles to the Delaware state line beyond Bishop. 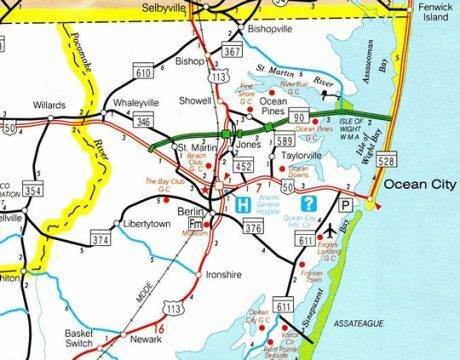 Mostly a rural route, the US highway sees interchanges with U.S. 50 and Maryland 90 (Ocean City Expressway) while bypassing Snow Hill along a controlled access expressway. Through Berlin, and older bypass encircles the east side of town, though with only two signalized intersections as others were converted to use J-turns. 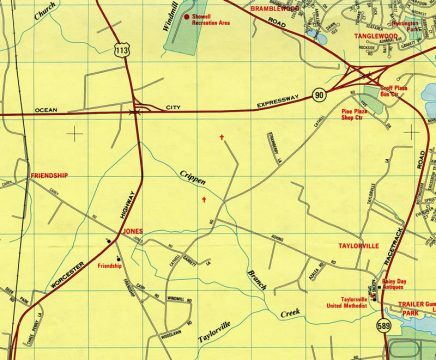 Only two sections of U.S. 113 were expanded to four lanes by the release of the 1973 Maryland Official Highway Map. Construction of the Snow Hill bypass was also underway at the time. The 2001 realignment of U.S. 113 bypassed a two-lane stretch of Worcester Highway north from Berlin to Maryland 589. Subsequent widening followed along the US highway north to Bishop and the Delaware state line. This 1990 map shows the original one-quadrant interchange between the Ocean City Expressway and Worcester Highway. It was removed after the relocation of U.S. 113 and new six-ramp parclo interchange with Maryland 90 opened to the west in 2001. U.S. 113 expands into a four-lane divided highway east of its former alignment along Bypass Road. A portion of Bypass Road is now a part of Maryland 359, which stems west from U.S. 113 on upcoming Groton Road. Photo taken 07/28/13. Northbound mileage sign posted 13 miles from Snow Hill and 28 miles from Berlin. 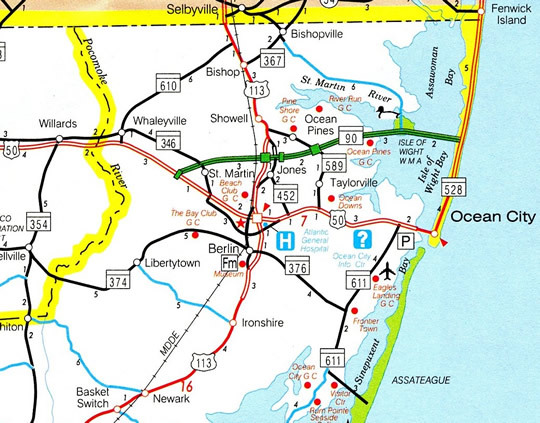 Ocean City lies at the east end of U.S. 50 in 36 miles. Photo taken 07/28/13. A 1.17 mile route, Maryland 756 arcs northeast along Old Snow Road from U.S. 13 at Linden Avenue to end at U.S. 113 (Worcester Highway). Photo taken 07/28/13. Curving east, U.S. 113 traverses an area of wetlands from MD 756 to Pilchard Creek. Photo taken 07/28/13. Johnson Neck Road stems east from U.S. 113 (Worcester Highway) toward Klej Grange ahead of this reassurance marker. Photo taken 07/28/13. U.S. 113 northbound passes by Shad Landing State Park after Corkers Creek. Photo taken 07/28/13. U.S. 113 shifts east to bypass the town of Snow Hill on a 1970s expressway. The former route was designated as Maryland 394 until 1997, when U.S. 113 Business was created.2 Photo taken 07/28/13. A weigh station lines the northbound lanes of the Snow Hill bypass after the split with U.S. 113 Business (Market Street) north. Photo taken 07/28/13. Castle Hill Road angles southeast from U.S. 113 Business (Market Street) to cross the Snow Hill Bypass before this reassurance marker. Photo taken 07/28/13. Traveling north from the Virginia state line, Maryland 12 passes through the rural communities of Stockton and Girdletree to intersect U.S. 113 (Worcester Highway) along Snow Hill Road. Photo taken 07/28/13. A 30.57-mile route, Maryland 12 leads northwest through Snow Hill to cross the Pocomoke River ahead of Indiantown. The state route ends at Main Street just east of Downtown Salisbury. Photo taken 07/28/13. U.S. 113 advances north from MD 12 to a J-turn intersection with Brick Kiln Road. Photo taken 07/28/13. Berlin is now 14 miles ahead, while U.S. 113 crosses paths with U.S. 50 in 17 miles. Photo taken 07/28/13. Turning more to the north, U.S. 113 approaches Maryland 365 (Public Landing Road) by John Walter Smith County Park and the Worcester County Health Department. Photo taken 07/28/13. Construction in 2015 reconfigured the intersection with MD 365 to eliminate cross traffic with J-turns. Traffic headed west to Bay Street and Snow Hill must now make a U-turn to access MD 365 west. MD 365 east extends to Mt. Wesley, Spence and Public Landing on Chincoteague Bay. Photo taken 07/28/13. "Governor Larry Hogan Announces Plans to Complete $136.8 Million Widening of US 113." Office of Governor Larry Hogan, press release. April 22, 2016.